Two weeks ago we bought a bunk bed. It’s amazing how buying this one simple item of furniture has changed our lives so much. O is now two and has spent all of his life sleeping in our bed, bar a couple of naps and the few months where he went down in his cot but came in with us a few hours later. His cot has simply been an extra storage space in our room for months! LV was still sleeping up in the attic with the girls even though the boys room was almost finished. Apart from a little tidy up all that was really needed was some curtains and some bedroom furniture. Everything else will come soon enough, but the bed was an immediate necessity. Now, LV finally has a real room of his own instead of squatting with his sisters and O? Well he is in his own bed too! As expected the first night didn’t go well. 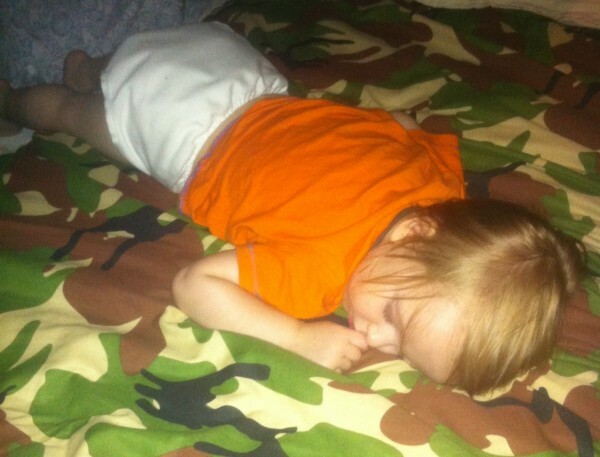 Have you ever tried to lay on the edge of a 2′ 6″ mattress while trying to settle an hysterical toddler? It’s not an easy, or comfortable, feat which involves wrapping your feet around the ladder and using one hand to keep your body on! He screamed bloody murder until he eventually exhausted himself, which didn’t set him up for a settled night at all. He cried intermittently, woke about 2am but went off after about 20 mins, then at 4am I brought him in to bed with me. The second night he slept right through until 5.30am when he came in with me and went back off for a bit. Since then we have had pretty good nights with him. He’s mostly woken between 4.30 and 7am with barely any disturbances at all, apart from once when he fell out of bed with a real thud and 3am. That one really upset him! To be honest, I really wasn’t expecting for things to go quite as smoothly as they have done. Bed times are still a bit iffy but this is mostly because it’s the summer holidays and the kids are all up much later than they would be during school time. Hopefully once we are all back into a routine he will settle down into a proper, more relaxed, bedtime. I’m sure there will be many years with early morning cuddles to come, plus the inevitable poorly nights which I still even get with the big girls sometimes, but we are no longer, and never will be again, a full time co-sleeping family. Which makes me a little sad. It’s the end of an era, but the start of a beautiful friendship that I can see blossoming now that the two boys are spending more time together in their room, which makes me so happy. Are/were you a co-sleeping family? When did your little ones move into their own beds? Steph recently posted…Mama Wears | Autumn Work Wardrobe Wish List – The right one! Wow, I’m always kinda in awe of anyone who co-sleeps, especially until toddlerhood, how do you DO it?! My son is in our bed right now (he only comes in for cuddles after 7am usually) and I’m already being elbowed, squashed and pushed out of the bed lol! Caterpillar was in his own room from about 5 months and has mostly been a good sleeper, although there have been times where he won’t settle and I’ve been forced to lay on the floor next to his cot until he settles (co-sleeping looked pretty attractive then I can tell you!). Becky (@educatingr) recently posted…Strictly Factor! Two years! I managed less than a year before waking up with an agonisingly sore back from lying in such a strange position next to Baby Bear all night became too much for me and I started putting him in his cot. I’m glad the transition’s going so smoothly for you. Baby Bear took some time to get used to his cot. Random Musings recently posted…Why Are STDs Still Seen As Taboo? We’ve never co-slept but I sometimes wonder if we should have tried it, for the snuggle factor more than anything! Well done mummy bear! Sounds like this one went really… we’re going to do this in about a month and half when Little Miss turns two. I’m nervous… but it’s just taking the side off the cot really, so should be ok… I hope!